It's Not Rocket Science: The laundry room is DONE!!! The laundry room is DONE!!! THE LAUNDRY ROOM IS FINISHED!!! And even though we forgot the camera today, I thought I would share what we did with you. After getting the washer and dryer hooked up, we knew there would be room for a cabinet. So, I looked around teh interwebs and found that I could get a decent sized (36" wide) standard wall cabinet (30" tall and 12" deep) from Ikea for $62. Definitely cheaper than buying an oak one like the kitchen cabinets ($97?) and sanding, priming, and painting it. 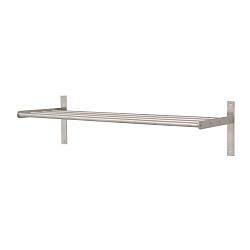 Then I found a shelf that we could use in the kitchen, also from Ikea. It's not on the website, but it's just 5 steel rails, 4 feet long, that we can use as a pot rack over the window in the kitchen. It fits in the space perfectly. So, I bought one ($26) and took it to the house and we assembled it. Yep, it fits in the kitchen! But you know where else it fits perfectly? That's right, the laundry room! Yay! That wall with the cabinet across from the W/D is something like 4'3", and technically the shelf is 47 1/4", so it fit nicely. The edge rail is perfect for hanging clothes on hangars to dry, too. Jk, I found a picture. The one I bought is longer, but you get the idea. 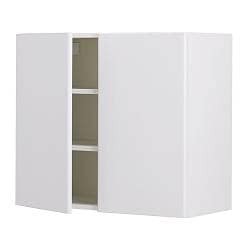 So today we went to Ikea on the way to the house, and picked up the Akurum cabinet with Harlig white doors. Translation: a white laminate cabinet with the cheapest white laminate doors they sell. This goes on a rail hung from the ceiling, and has one of those hanging stick thingies that you pull/push to make it move back and forth. It doesn't cover the whole doorway, but placed in the right spot it hides any clothing hanging from the shelf. Mission accomplished! It actually looks really cool, so I can't wait to upload pics. So, we hung the cabinet all the way at the top of the wall, right next to the ceiling. The top shelves will be for sewing kits and other rarely used items. We hung the shelf at a little above counter height (42" vs. 36") so that hampers fit underneath it (ones I already own) and so that clothes can hang easily from the outer rail while clearing the ground. We installed the panel curtain on the inside wall of the laundry room, hanging from the ceiling. It slides out of the way next to the washer and dryer most of the time, and will "close" the room for guests. Finally, we hung a little thingy that you place your iron in. It hangs on the wall very nicely, hidden on the far side of the wall cabinet. Again, can't wait to upload pics, and I am so excited that one room is finally done! We're still working on the kitchen... had to do a little bit of outlet re-arranging today (it was going to be stuck behind the range, no good), then we'll finish drywalling that side of the kitchen, then prime and hang cabinets. The cabinets are in the garage; about half have been sanded and primed, and some others still need to be prepped for painting, and we still need to pick up 3 from Home Depot. Chris did order a paint sprayer, so I hope we can get a really professional look on our DIY paint job. It's been hard getting an even coat of primer by combining paintbrushes for detailed molding and a foam roller for the flat surface areas. Plus, we'll use the sprayer for all the outdoor furniture I'm going to build, as well as for staining the deck and probably painting the shutters at some point. But again, yay! Victory over one small room!